Bigeye trevally are carnivorous. Adults are generally found in schools by day along lagoon or channel or offshore reef drop-offs. They primarily feed at night on fish and crustaceans. Their depth range is from 1 - 90 metres. Bigeye Trevally juveniles live among the tentacles of jellyfish, and often enter estuaries and have even been known to venture into freshwater. They often congregate in open seas around floating objects or artificial reefs such as FADS (Fish Attracting Devises) Adults inhabit deep lagoon and offshore reefs where they sometimes feed by rooting in the sand for invertebrates. 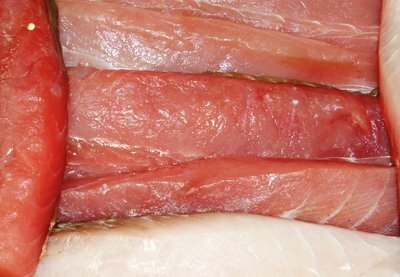 Raw trevally flesh is pinkish, but lightens when cooked. It has medium texture with a medium to high fat content. The flavour is very mild, though slightly fishy. Taste, Texture mild, slightly fishy. Medium texture. Trevallies have superb eating qualities, with a strong but not overpowering flavour. They are an excellent choice for children as their bones are easily removed. The flesh is darker in colour when raw but once cooked the flesh turns brilliant white. It has a full flavour with a medium to firm texture. Bake, grill, smoke and deep or shallow fry trevally, but preferably serve skinless. They can be excellent in sashimi and popular when served fried with chips. Smoking helps to reduce the oiliness, which is high in some species. Curried or herbed mayonnaise makes a delicious accompaniment.